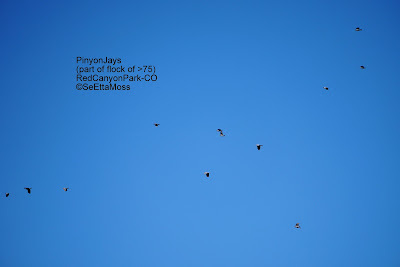 I found a nice size flock of Pinyon Jays yesterday at Red Canyon Park. There were quite a few more than 75 in total when I got these pics as the whole flock flew over but at times smaller groups would fly about. I spotted this Common Black Hawk perched in the branches of a tree as I drove around the road on the east side of Bosque del Apache National Wildlife Refuge this afternoon. It is amazing how that black plumage blends in with the habitat. Common Black Hawk is a pretty rare species whose range in the U.S. is limited to restricted areas of the Southwest. Birds of North America online states, "... total U.S. breeding population estimated 220–250 pairs." A search of Ebird shows two sightings of this species at Bosque del Apache in the past month, presumably this same bird. That said a Common Black Hawk was vagrant in my town of Canon City, Colorado for a month in 2006 followed by a short visit in 2007. 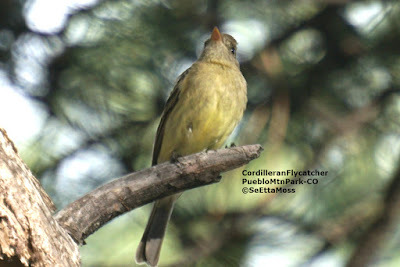 You can see that bird on my post about it on my SE Colorado Birding blog that I ran prior to this blog. If you enlarge the pic above (just click on it) there are more than 60 Common Nighthawks in that one photo. All in all this flock of migrating Common Nighthawks totaled at least 75 and more likely 100 birds--absolutely the most nighthawks I have ever seen at one time. Click on this second pic also to see identifiable nighthawks. When I first spotted this flock they looked like a river of birds in the sky and I thought it must be a flock of gulls as I have seen similar flocks flying kind of in a line that were gulls-and I couldn't imagine it was a flock of nighthawks, a species that has been in decline and that I have seen in smaller numbers here year after year. I found the 4 Eastern Kingbirds shown on this fence plus 2 more further down this same fenceline yesterday at a farm in the Canon City area. It really made me wonder if it was just some amazing coincidence that *6 Eastern Kingbirds* would end up on less than a hundred feet of fence on this farm at the same--or could they have traveled together as they migrated north?????????????????????? Both the Western Tanager and Lazuli Bunting are first of the year birds in Canon City (tho I saw W Tanager on S Padre Island 2 weeks ago so not my first of the year). I spotted 4-5 male Western Tanagers in a one mile walk on the Canon City Riverwalk. Heard a lot more Lazuli Buntings than observed--just this one observed, heard at least 4-5 others singing. This Black-headed Grosbeak had been singing up a storm as were several more of his species today and in the past few days.